The WRU-806B plug-in diversity tuner module is the most popular choice for WL-800 series wireless mic installed system applications. Up to six WRU-806B modules can be installed into one MB-X6 tuner base (see MB-X6 for more details). The WRU-806B42/44 operates over a 24 MHz frequency band, within the range of 638 MHz to 662 MHz (TV channels 42, 43, 44 and 45). Pre-programmed frequency groups are provided for virtually interference free, mulitchannel operation. 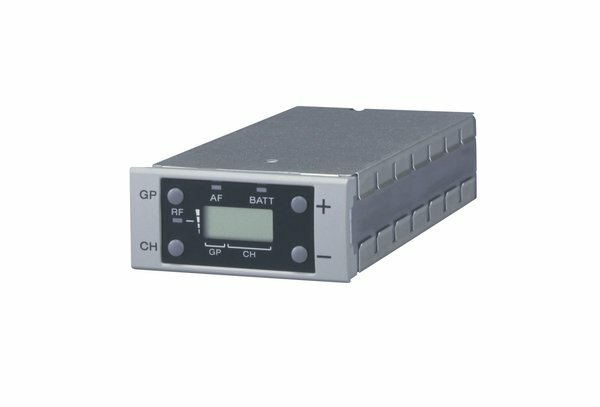 It also includes an easy-to-read LCD with comprehensive system information such as RF input status, audio output status, TX battery alarm indication, group/channel number and channel frequency in MHz. Space Diversity Reception This system uses two antennas, with the receiver constantly comparing the signal from both antennas, and choosing the strongest signal. Remote Battery Alarm Monitors battery status of transmitters that transmit battery status. Compatibiity: For use with WL-800 Series wireless products operating within the same frequency block. This modular tuner is compatible with the MB-X6 tuner base or SRP-X700P and SRP-X500P powered mixers.